The Playstation 4 has been killing it this generation. Not only because Sony knows how to speak to their audience, but because they also know that the best talking is done by high quality, highly rated exclusive titles. 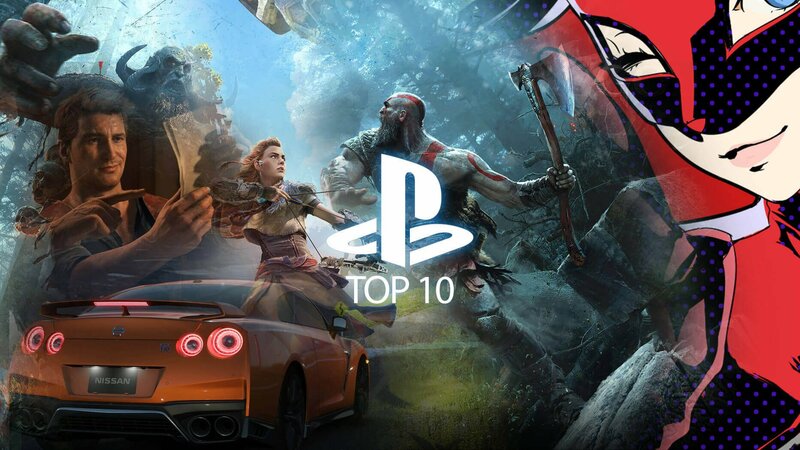 If you’re just jumping onboard now or thinking to expand your library, we’ve put together a list of our personal 10 best exclusive games available to buy and play only on the Playstation 4 right now. Guerilla Games decided to take a crack at a third-person open world RPG and boy did they nail it with something that is somewhat of a “greatest hits” of the genre. It’s beautiful, it’s big and oh yeah, it has giant robot dinosaurs. What’s not to love? Nathan Drake returns for exactly the kind of visually stunning action adventure that you’d be right to expect from the almighty Uncharted series. No one does it quite like the veterans at Naughty Dog and so you can get ready for a lot of fun, exploration, gunfire and Drake shouting “No, no, no, no, no!” while something crumbles around him. Kratos got a major reboot, and it instantly shot to the top of everyone’s Game of the Year nominee lists. While the old games were awesome, they’ve aged and something new was needed. Take the world of God of War, change the setting/theme to Norse Mythology and then add a splash of Dark Souls and a dash of The Legend of Zelda and you’ve got one hell of a game on your hands. It’s also a lot bigger than you might expect, but it delivers on heavy hitting action and some solid and often funny dad and son moments. This was my first ever experience with a “souls” game and boy did it just blow me away. Faster than Dark Souls and just a whole lot cooler overall, Bloodborne delivers all of the thrills that come with skills that can only be delivered by forcing you to go out on a limb every time you are out in the world. It’s vicious and tough, but it’s just so darn rewarding. I’m also a sucker for the whole Victorian Horror vibe. GT Sport had a rough start, but has blossomed into a beautiful young video game that you should all want to take to the prom. At launch the cars felt and looked great in the way only GT games do it, but it was online only and really just a multiplayer game. It’s since received update after update or extra content, career-like modes and more to bring it around and make it a pretty solid racer for your console. I still do miss a good old fashioned Gran Turismo game though. I feel like this game is really underrated. It’s not unloved completely but man, I just had such a good time playing this interactive teen-slasher movie. Like a mix of a Quantic Dreams and Telltale Games titles, it’s essentially the modern version of the “point and click” adventure games we grew up loving so dearly. The motion capture and performances were great, and the game had just the right amount of scare factor to make it really fun without being a huge turn-off to people that feel uncomfortable with the horror genre. Now here’s a game where I have to take other people’s word for it, and so should you. I’ve never played Persona 5, or any Persona for that matter but it just looks so damn cool doesn’t it? I can’t just put it in here because it looks cool though, I’m doing it because when this game came out everyone absolutely wouldn’t shut up about it. You just know it’s one of those special things. So why haven’t I played it yet, well it’s because I’ve already got a big backlog and Persona 5 needs around 100 hours of my time. I wish I had nothing else to play and do just so I could finally convince myself to finally get stuck in. Quantic Dreams games aren’t everyone’s cup of tea, but they sure are mine when done right. I loved Heavy Rain a whole lot, but didn’t quite gel with Beyond: Two Souls and so I had high hopes for Detroit. While I wouldn’t say that it is as good as Heavy Rain was in its day, it delivers an incredibly large, branching cinematic experience with incredible visuals and character animations. The story really can go in some pretty different directions, and once I finished the game I was stunned to go back to some chapters and watch videos online only to see how much things could change. I love near-future sci-fo too, so… I’m a sucker for that too. Marvel’s Spider-Man looked impressive when it was revealed, but I must be honest when I say that I wasn’t sold right away. While I always be fond of Spider-Man 2 on PC and I actually really enjoyed Shattered Dimensions, I’ve always found that Spider-Man games weren’t actually all that fun. It’s not easy to balance his style of quick combat with an open world and still deliver on any sort of decent story or gameplay experience that didn’t actually get a bit tired after a while. That’s all changed because Spider-Man on PS4 is by far the best Spider-Man game ever made, and a great game in its own right because it delves into the life of both Spider-Man and Peter Parker, with great writing and shifts in pace that have you solving puzzles as Peter Parker just as yu got a bit tired of swinging around stopping crimes. The swinging though… just top notch. This might be a remaster of a PS3 game, but its on this list because I consider TLOU to be one of my Top 3 favourite games of modern times. Naughty Dog already showed us that it can do action and fun with Uncharted, but then as if almost just to show off they decided to give us something dark, gritty, grounded and ready to punch your right in the feels. The story of Joel and Ellie is something that has stuck with my since playing it, and we absolutely cannot wait for the sequel. I initially opted to take it off of the list itself but ultimately decided to add it here as a bonus. It’s just so damn solid with such great characters (Chloe and Nadine take centre stage this time), an action packed second half that it really deserves to be seen as its own title, especially since it doesn’t require the original game to work. I titled the review Uncharted.zip because that’s really what you’re in for… a full Uncharted experience compressed into around 6-8 hours. I loved it. So there you have it! There are some other great titles that deserve to be on this list, but I already added a bonus and well… I’d love to hear what you think. If you’re looking for something to play, you’re not gonna go wrong with any titles here, happy gaming!